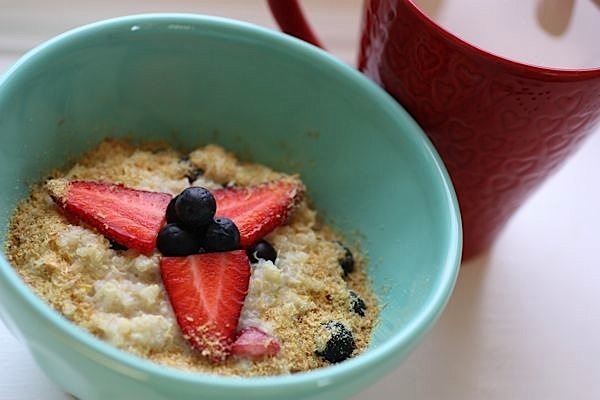 Berry Breakfast quinoa! Nomalicious and so nutritious, too! Not to mention this is vegan and gluten-free! I was excited about both trying my quinoa in a sweet dish and trying my new Tempt vanilla hemp milk that I got on my massive grocery shopping trip last Sunday . 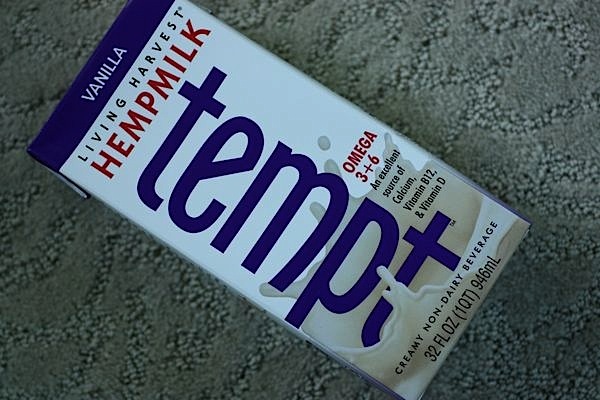 I’ve heard such good things about hemp milk but have hesitated to try it because it sounds weird and it’s expensive. Whenever I try something new, I like to make sure to taste it solo so I can really taste the flavor of the ingredient. I poured a mini cup of the hemp milk this morning while I was making breakfast so I could sample this new (to me) non-dairy milk. Turns out it’s not weird at all! 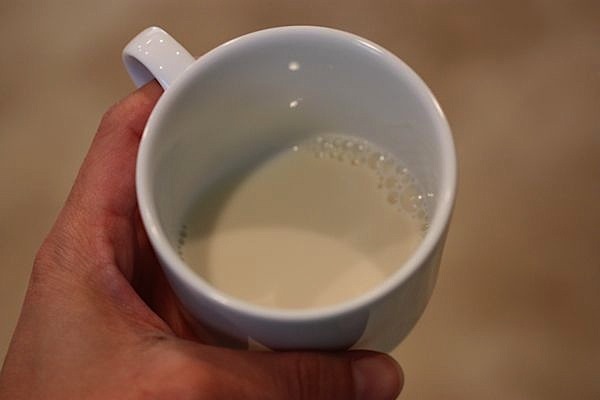 If you like other non-dairy milks, you’ll probably like hemp milk. I like to mixin fruits to my breakfast cereals whenever possible. Tonight I used mixed berries (blueberries, strawberries) leftover from those yummy mini vegan/GF tarts I made on Sunday. Breakfast is such a good way to use up leftovers, no?! 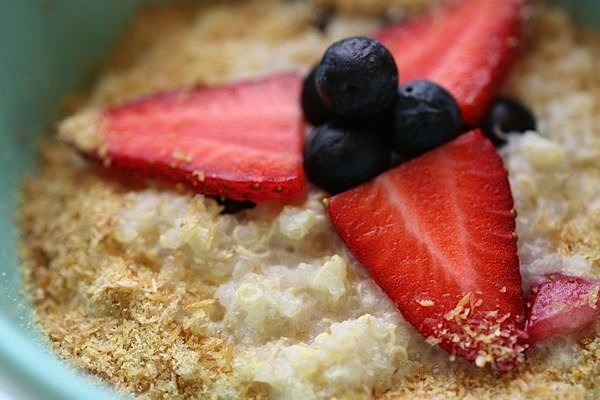 Cook quinoa in a water and milk mixture. 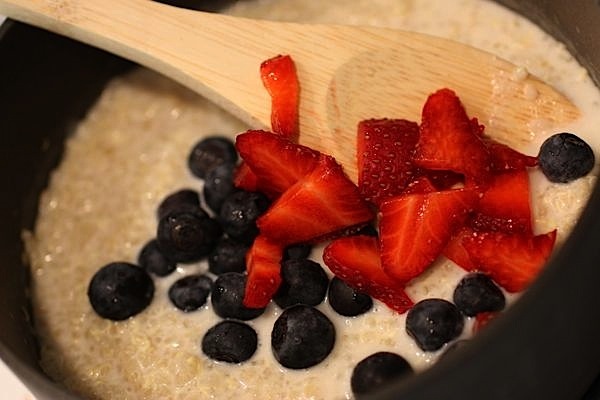 Add berries. Add sweetener. Easy-peesy! Mixed berry breakfast quinoa – yum! Perfect with hot Fresh Market Spring Blend coffee. 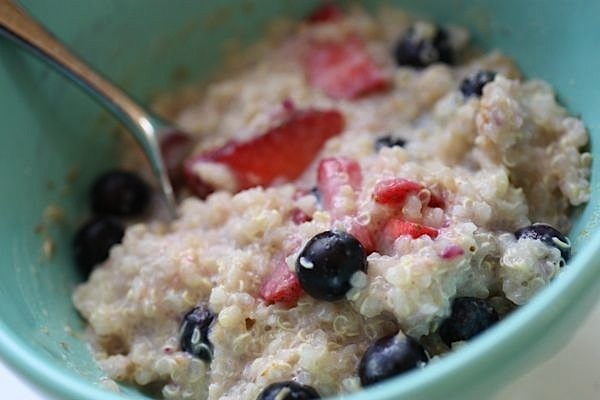 As it turns out, quinoa is not nearly as sweet as rolled oats, so even though I used vanilla milk (already sweet) and even though I normally try to get my sweeteners from fruit instead of adding sugar, etc., I did need to add extra sweetener to todays breakfast. I made the cereal without any added sweeteners, but ended up stirring some organic cane sugar in after sampling the first couple bites. 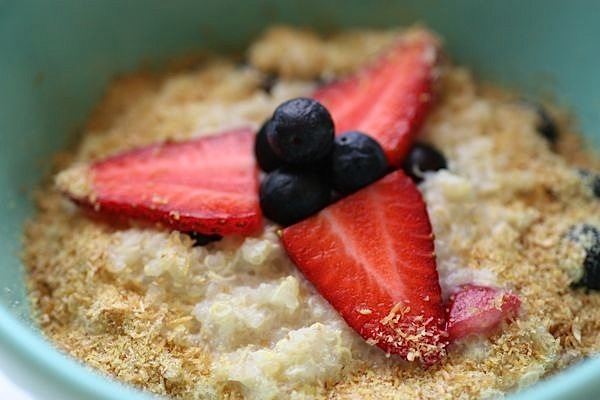 I still prefer my oatmeal since oats seem to be creamier and have a nice chewy texture, but for the powerhouse of nutrition that is quinoa, this is worth adding to the rotation now and again. 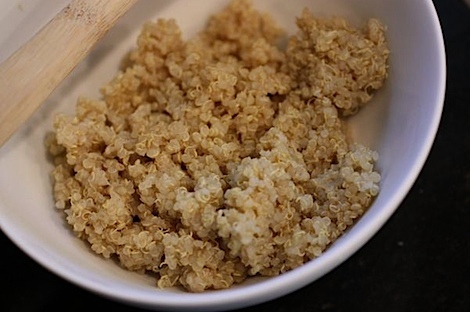 Combine quinoa and milk in a small pot over medium low heat. Simmer till thickened up to your liking. Try to not let the mixture boil, at least not much. Add berries to pot and cook to heat through (you can add them earlier, but I prefer to add them closer to the end of cooking). Serve in a bowl and top with ground flaxseed or flaxseed meal. NOTE: You can get creative with your mixins and sub almost anything for the fruit – dates, bananas, apples, etc. 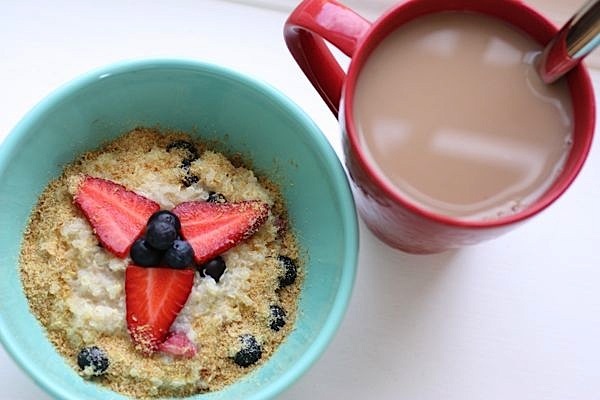 Add nuts and seeds as you like…just like you’d do with oatmeal! Have you tried quinoa for breakfast? What did you think? I love quinoa and have really wanted to try it as a breakfast hot cereal. Thanks for a little inspiration to try it out. I actually really like sweet quinoa! I made a mousse with it and added some protein powder and stevia to the mix to bump up the sweetneer! I am a huge fan of Hemp milk too, but it is so expensive. Your breakfast looks delicious! I love how quinoa looks like little commas though. So cute! 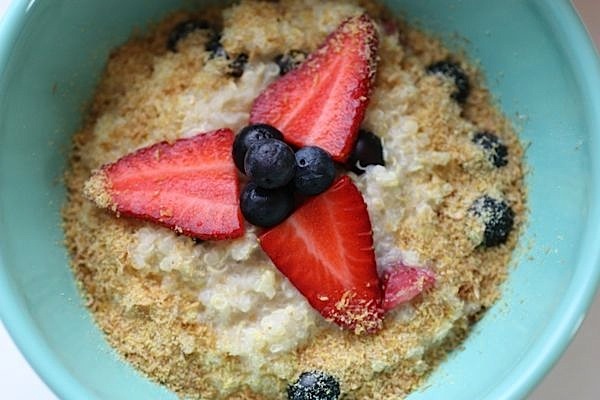 I just cooked some Quinoa and will have this recipe for breakfast tomorrow morning. I’m just proved to be sensitive to oats so my oatmeal is on hold for a while. This is a powerhouse of calcium and protein. Perfect way to start the day. I just made this with frozen strawberries and blueberries, cinnamon and agave! So good! Thanks for the recipe! I found your site through KERF and I’m bookmarking so many of your recipes! I’m making the Spinach and Cheese Strata tonight! Hey, I was reading your post and I just wanted to say thank you for putting out such great content. There’s so much nonsense on the internet these days its difficult to find anything worthwhile. I actually have cooked this recipe before, I got this book last month on recommendation from a friend http://ninjahq.com/go/cookingrecipes and it turned out really nice! I’m extremely eager to try your variation of it though, it looks excellent. I think you might enjoy those recipes, they’re very good. Thanks for the article and tips. This is an awesome idea. I put craisins in minebecause I wanted to start using them…delish. 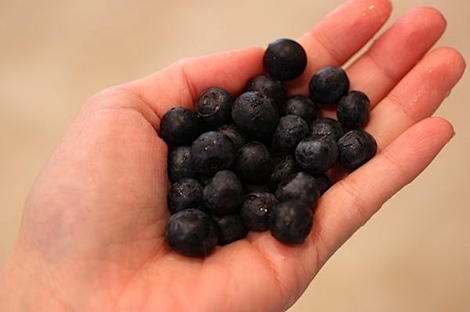 I used blueberries & apple! SO good 🙂 I also added organic cane sugar.